Patrick Joseph “Paddy” O’Brien was almost the perfect footballer for his era. Highly skilled, athletic and as tough as teak, he played 167 games and kicked 7 goals for Carlton in a celebrated career that stretched over 13 seasons between 1913 and 1925. Two of those matches were Grand Final victories; in 1914 over South Melbourne, and in 1915 over Collingwood. He also played in two other losing Grand Final sides (in 1916 and 1921), won the game’s highest individual honour, and served as both playing coach and captain of the Old Dark Navy Blues. Paddy was born in Footscray in 1893. At 18 years of age he scaled 183 cm and 83 kg when he was crowned Victorian Amateur Middleweight Boxing Champion. At that time he preferred boxing to football, and was outstanding at both sports. However, when he stepped up to the heavyweight division, a fractured hand ended his ring career. By 1912, O’Brien was starring in the ruck for Yarraville in the VFA, and it was only a matter of time before he launched a VFL career. Footscray apparently showed only lukewarm interest, so Carlton swooped, and Paddy played his first game for the Blues - ten days after his 20th birthday - in the opening round of the 1913 season, against Essendon at the East Melbourne Cricket Ground. Wearing the number 10 guernsey that would grace him for the next 13 years, Paddy was part of a dominant following division that paved the way to a 16-point win to the Blues. Although Carlton finished a mediocre sixth in O’Brien’s debut year, the team improved markedly in 1914, and swept to the minor premiership. This set the stage for Paddy, who showed that he was a genuine big match performer by being judged best, or near-best on ground, in all three of Carlton’s finals games – a series that culminated in the Blues’ thrilling six-point Grand Final victory over South Melbourne. As the looming spectre of war in Europe cast a pall over most of the world, O’Brien played in his second successive Carlton Premiership side in 1915, when the Blueboys wrested the initiative from Collingwood in a hectic last quarter, and pulled away to win by five goals. Twelve months later, he came back from an extended illness to play in his third straight Grand Final, when Fitzroy caused a boilover and knocked over a confident Carlton by 29 points. But it was his switch to centre half-back in 1917 that defined O’Brien’s career. Surprisingly quick for his size, with a good leap and steely concentration, he settled into the key defensive post, and had a blockbuster season that saw him awarded the games most prized individual honour at that time; Champion of the Colony. With Carlton’s defence built around him, the Blues were perennial finalists over that period, and Paddy experienced the fanatical atmosphere of Grand Final day for the fourth time in 1921, when Richmond edged out Carlton by just 4 points in a classic contest on a wet, yet still jam-packed MCG. 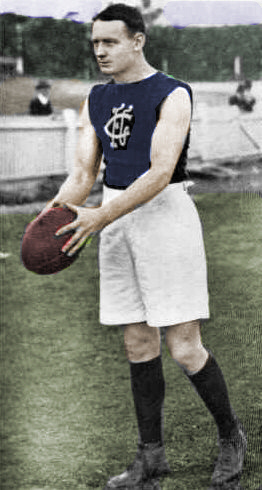 O’Brien was appointed captain of the Carlton Football Club for the first time in 1920 when Charlie Fisher was forced into premature retirement by injury. He relinquished that honour in favour of Charlie Canet in 1921, but three years later, temporarily stepped up to the leadership role again when Horrie Clover was struck down by a serious illness. By then, O’Brien was Victoria’s first choice centre half-back, and had played his 12th interstate match in the 1924 Hobart Carnival. In 1925, O’Brien accepted a role as Carlton’s playing coach - under the captaincy of Maurie Beasy – but the experiment not only didn’t work, it unfortunately created friction that brought Paddy’s time at Princes Park to an abrupt end. After only five more games for the Blues, he demanded a release to play with Footscray, and Carlton didn’t stand in his way. Although always at heart a Blue, Paddy played another 15 senior matches over two seasons in the red, white and blue for the 1925 and 1926 seasons. Thankfully, O’Brien’s genes weren’t lost to Australian Football in general, or to the Carlton Football Club in particular. In 1954, Paddy’s solidly-built nephew, Kevin O'Brien, pulled on guernsey number 22 for the first of his 9 games with the Navy Blues. Almost 50 years further on, a great-nephew in Mick Martyn crossed from North Melbourne to Carlton, and finished off his impressive career at exactly 300 games. Forty-two years later in 2006, Paddy was inducted into the Carlton Hall of Fame. O'Brien also wore Guernsey No. 30 early in the 1913 season whilst he was playing with Carlton's reserves team. Contributors to this page: blueycarlton , pblue , Bombasheldon , PatsFitztrick , molsey , WillowBlue , Jarusa , true_blue24 and admin . Page last modified on Sunday 15 of December, 2013 09:09:26 AEDT by blueycarlton. 1995 Rd 22 - Craig Bradley.